After Jesus was executed, his followers claimed that he had risen from the dead three days later. This becomes the fundamental belief of Christianity: that Jesus was resurrected and a belief in him would lead to everlasting life. The first Christians were Jewish. They lived in small communities and still practiced traditional Jewish holidays and rituals. Gradually, the Jewish nature of these early Christians began to fade as new rituals took hold. There was no uniform set of beliefs or a “Bible” in the early days. Consequently, there were hundreds of gospels written at this time. Christianity might have remained a strictly Jewish sect if it were not for one man: Paul, who was considered the "father of Christianity." Paul was not Jewish, but a gentile who persecuted Jews. However, he would soon convert to Christianity and dedicate his life to spreading the new religion. 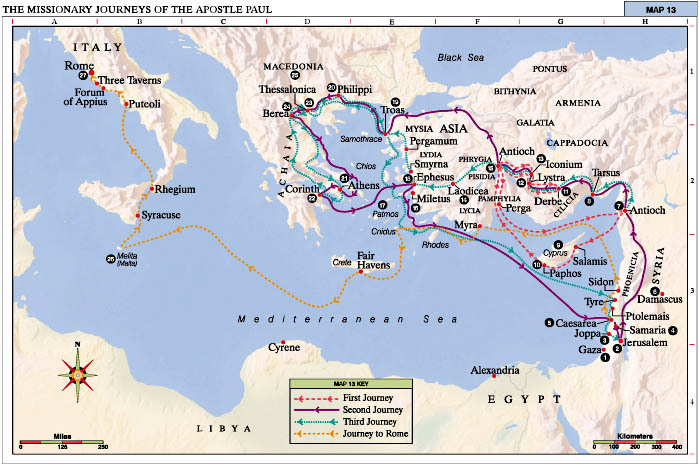 He traveled all over the Roman world, spreading the message that Jesus was for everybody, not just Jews. He preached that Jesus was the Son of God, the Messiah. Paul would eventually travel to Rome, where he too would be persecuted and crucified. Without Paul, Christianity may not have become the prominent religion in the Roman Empire. Christianity appealed to the common people and the poor. In a time when the Roman Empire was a corrupt and decadent place, Christianity offered something else. Christianity also gave converts a sense of community. 60+ CE The Roman empire begins persecuting Christians because they did not accept the divinity of the emperor. Thousands are killed during gladiator games and fed to wild animals. In order to get out of being killed, all that they had to do was to say that the emperor was a god. They did not do this but chose to be martyrs instead. This strengthened the religion as more people sought to learn about Christianity. As was told, "the blood of the martyrs was the seed of the church." Watch this short clip below from the 1951 film, Quo Vadis, which shows Nero persecuting Christians in the Coliseum. 313 CE Emperor Constantine issued the Edict of Milan, which decriminalized Christianity and provided tolerance for all religions. It also declared that all church property that had been seized be returned. 325 CE The First Council of Nicaea meets to decide the universal doctrines of Christianity. They declare the belief that Jesus was the Messiah with the "Nicene Creed" which is still used in Christian churches today. 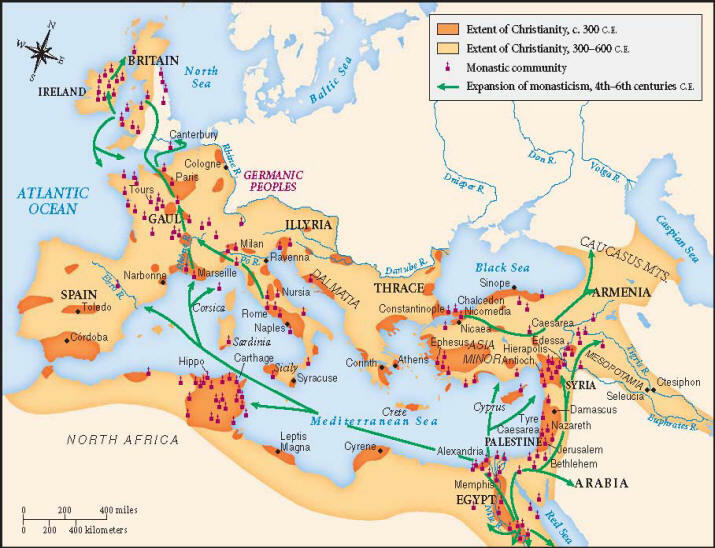 As Rome continued to decline in the 5th century C.E., Christianity began taking hold in the outer regions of the empire. Missionaries helped spread the religion as a church simply known as "catholic" began to take shape. "Catholic" is a Latin term that means "universal."